Most of the history of this time period that affected England was actually taking place in France. 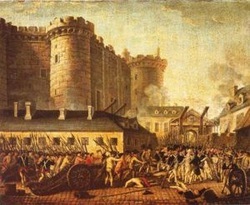 The French Revolution began on July 14, 1789, when a mob stormed the Bastille, a Paris prison for political prisoners. This impacted England in that the ruling class felt threatened by what was going on in France. The Reign of Terror: King Louis XVI of France was charged with treason and beheaded. Various royalists and moderates were being executed by a group of people called the Jacobins. People were scared for their lives. 1793, France declared war on Britain. This led to a series of wars that lasted 22 years. Napolean wanted to expand France's territory. In England, Industrial Revolution was causing problems with overcrowded factories and unsafe working conditions. Working class was growing restless.